The Wolf 1055 binary system is located about 19.2 light-years away in the north central part (19:16:55.3+5:10:8.1 for Star A and 19:16:58.1+5:9:11.1 C~ for Star B, ICRS 2000.0) of Constellation Aquila, the Eagle -- north of Delta Aquilae, west of Altair (Alpha Aquilae) and Alshain (Beta Aquilae), and southeast of Deneb Al Okab Australis (Zeta Aquilae). The high proper motion of Star A was first discovered in 1919 by Max (Maximilian Franz Joseph Cornelius) Wolf (1863-1932), a pioneer of astrophotography who discovered hundreds of variable stars and asteroids, and about 5,000 nebulae by analyzing photographic plates and developing the "dry plate" in 1880 and the "blink comparator" in 1900 with the Carl Zeiss optics company in Jena, Germany. Star A's high proper motion was later rediscovered by by Frank Elmore Ross (1874-1960), who reported on the star in April of 1927 with his "Fifth List of New Proper-Motion Stars," Astronomical Journal (37:886). However, many astronomers now refer to this system as Gliese 752, its designation in the famous Gliese Catalogue of Nearby Stars (CNS, now ARICNS database) of Wilhelm Gliese (1915-93). Gliese was a longtime astronomer at the Astronomiches Rechen-Institut at Heidelberg -- even when it was at Berlin. 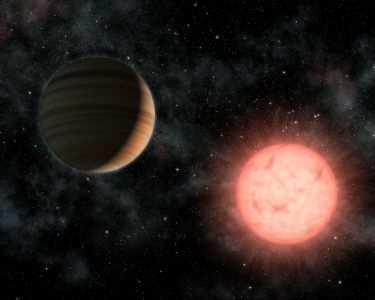 On May 28, 2009, two astronomers (Steven Pravdo and Stuart Shaklan) announced the discovery of a Jupiter-class planet "b" around Wolf 1055 B (or VB10 or Van Biesbroeck's Star), but the existence of this planet has been disputed by astronomers who failed to detect the planet using radial velocity measurements (NASA / JPL press release and associated Planet Quest new release; Pravdo and Shaklan, 2009; Magee McKee, New Scientist, May 28, 2009; and Astronomy Picture of the Day -- more below). The binary system of red dwarf stars is too faint to be seen with the naked eye. 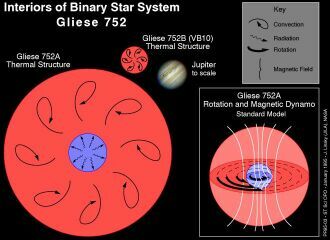 Both Stars A and B are flare stars, but the fainter member of the system was once thought to be low enough in mass to be a possible brown dwarf and is now commonly referred to as "Van Biesbroeck's Star" (or VB 10) after its discovery in 1940 by George Van Biesbroeck (1880-1974). Wolf 1055 A and its companion Van Biesbroeck's Star have a combined mass of over half of Sol's but less than 11/100,000th of its brightness. In 1942, the two stars were separated by about 434 AUs -- 73.8", 151.5d, in 1942.3 (George van Biesbroeck, 1951; and 1944). This cool and dim, main sequence red dwarf star is of spectral and luminosity type M2.5 Vne, but the star has been class as orange as M2 and as red as M3.5. Wolf 1055 A may have about 48 to 50 percent of Sol's mass (Mercedes López-Morales, 2007, GJ 752 in Table 1; and RECONS), 52.4 percent of its diameter (Mercedes López-Morales, 2007, GJ 752 in Table 1), and less than 0.2 percent of its visual luminosity (Linsky et al, 1995). Star A has sub-solar metallicity, with around 89 percent of Sol's abundance of iron relative to the amount of hydrogen (Mercedes López-Morales, 2007, GJ 752 in Table 1). 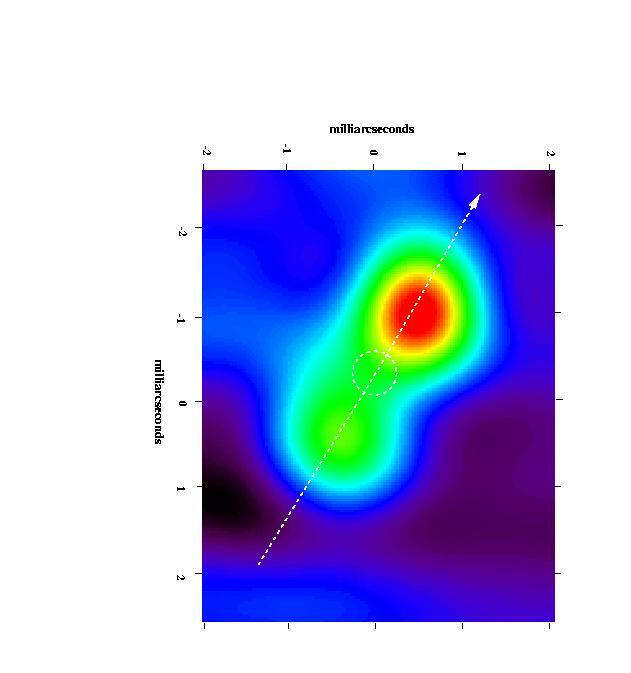 It exhibits a long-term periodicity in its chromospheric activity cycle of around seven years (Buccino et al, 2011). If Star A is presumed to have been born from the same nebula as its stellar companion Van Biesbroeck's Star (VB10), then it is probably around one billion years old (Martin et al, 1999). As a flare star, Star A has been given the variable star designation V1428 Aquilae. Some useful star catalogue numbers are: V1428 Aql, Gl 752 A, Hip 94761, HD 180617, BD+04 4048, G 22-22, G 142-24, LHS 473, LFT 1466, LTT 15645, Vys/McC 65 A, and Ross 652. With a spectral type of M2.1, Lalande 21185 can be used as a rough proxy for Wolf 1055 A (M2.5). According to one type of model calculations performed for the NASA Star and Exoplanet Database, the inner edge of Barnard's habitable zone should be located a little closer to the star, at around 0.139 AU from the star, while the outer edge lies around 0.272 AUs. Accounting for the great infrared output of M-stars like Lalande 21185, the equivalent orbital distance for an Earth-type planet would be around 0.22 AUs (Lisa Kaltenegger, 2005, page 48). At a little over half of Mercury's distance in the Solar System, however, the rotation of the planet could become tidally locked with the star so that one side would have perpetual daylight with the other in darkness. Assuming that Lalande 21185 does have 46 percent of Sol's mass, a small Earth-type rocky planet would complete its orbit the star in less than 56 days. This often even dimmer, main sequence red dwarf star (M8 Ve) may have only around 7.79 percent of Sol's mass (Pravdo and Shaklan, 2009; and Lépine and Shara, 2005), 10.2 percent of its diameter (around the size of Jupiter), and less than 11/10,000,00th of its visual luminosity (Linsky et al, 1995). This very cool M dwarf has an interior temperature of only about 2,700° K -- or 2,400° C or 4,400° F (Schweitzer et al, 1996). As a flare star, Star B has been given the variable star designations V1298 Aquilae and CSV 102917. Useful catalogue numbers include: V1298 Aql, Gl 752 B, BD+04 4048 B, LHS 474, LTT 15646, LFT 1467, Ross 652 B, Wolf 1055 B, Vys/McC 65 B, and VB 10. On October 12, 1994, a team of astronomers used the Hubble Space Telescope's Goddard High Resolution Spectrograph to make a one-hour long exposure of Van Biesbroeck's Star (VB 10). In the last five minutes of the exposure, a flare with flared with bright far-ultraviolet emission was detected. Although the star's normal surface temperature is 4,500° F, the sudden burst heated VB 10's outer atmosphere to around 270,000° F. The astronomers attributed this rapid heating to the presence of an intense, but unstable, magnetic field (Linsky et al, 1995). 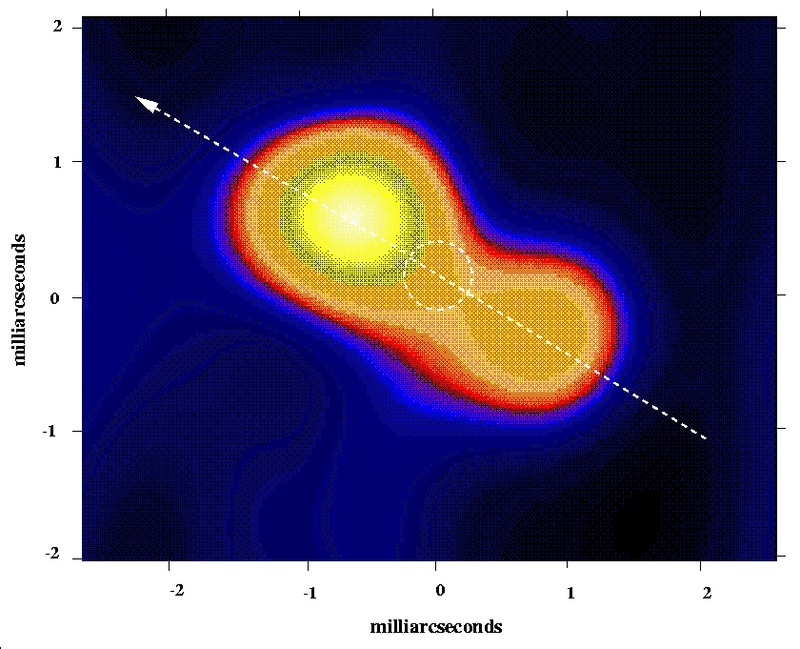 Subsequently, an x-ray flare was detected from the star (Fleming et al, 2000). Powerful magnetic fields might exist around the lowest mass stars, which are near the ignition threshold for hydrogen burning at their cores. Stellar flares are caused by intense, twisted magnetic fields that accelerate and contain gases which are much hotter than a star's surface. Since VB 10 is nearly a brown dwarf, it is likely brown dwarfs also have strong magnetic fields (like LP 944-20). The distance from Wolf 1055 A and VB 10 where an Earth-type planet would be comfortable with liquid water around or less than 0.1 AU (Pravdo and Shaklan, 2009), with a "year" of less than 14 days. 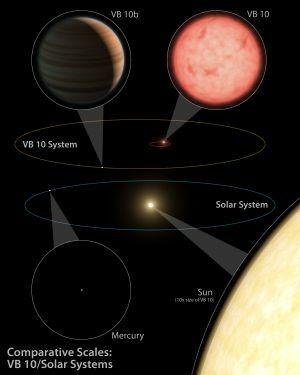 For Van Biesbroeck's Star, the orbital distance would be 0.0017 AUs without accounting for infrared heating. At thoses distances, the rotation of the planet would probably be tidally locked with the star so that one side would have perpetual daylight while the other would be in darkness. Astronomers would find it very difficult to detect using present methods. 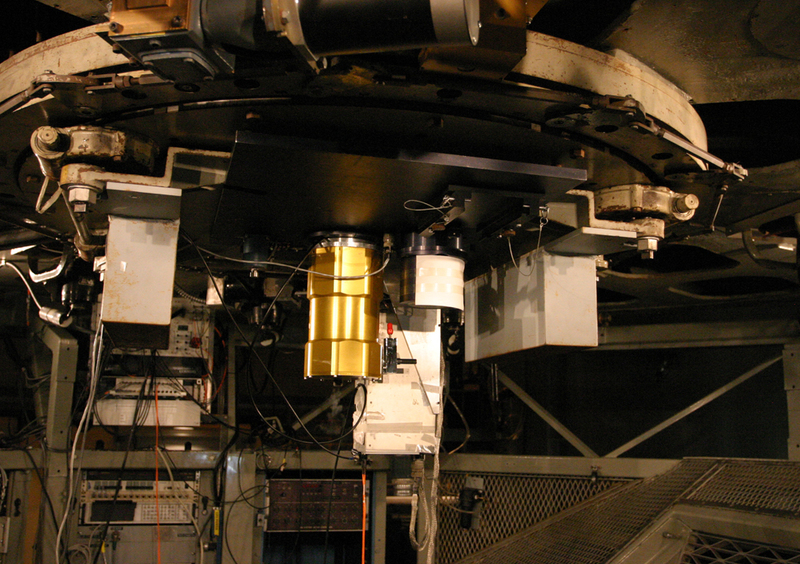 On December 1, 2009, a team of astronomers using the CRyogenic high-resolution InfraRed Echelle Spectrograph (CRIRES) at the European Southern Observatory submitted a pre-print arguing that the lack of supporting evidence from radial velocity measurements indicates that the astrometric data suggesting the presence of a giant planet around Wolf 1055 B (VB 10) must be "spurious" (Bean et al, 2009). may have a planet "b"
On May 28, 2009, two astronomers (Steven Pravdo and Stuart Shaklan) announced the discovery of a Jupiter-class planet "b" around Wolf 1055 B (or VB10 or Van Biesbroeck's Star) (NASA / JPL press release and associated Planet Quest new release; Pravdo and Shaklan, 2009; Magee McKee, New Scientist, May 28, 2009; and Astronomy Picture of the Day). Similar in diameter to its host star, the planet has around six times (6.4 +2.6/-3.1) the mass of Jupiter. It has a "cold" orbit of around three-quarters of a year (0.744 +0.013/-0.008 year in the most likely model) from its very dim, light-weight star at a semi-major axis of only 0.0360 +0.006/-0.016 AUs (a little under the orbital distance of Mercury in the Solar System), with an extremely ellipitcal orbital (a very high eccentricity, e < 0.98 an)d an inclination 96.9 +7.4/-1.8 degrees (Pravdo and Shaklan, 2009). to that of Mercury (more). The planet was found using astrometry, measuring subtle changes in position in the expected motion ("wobbles" or perturbations) of a star through space resulting from the gravitational pull of a planet on its host star. 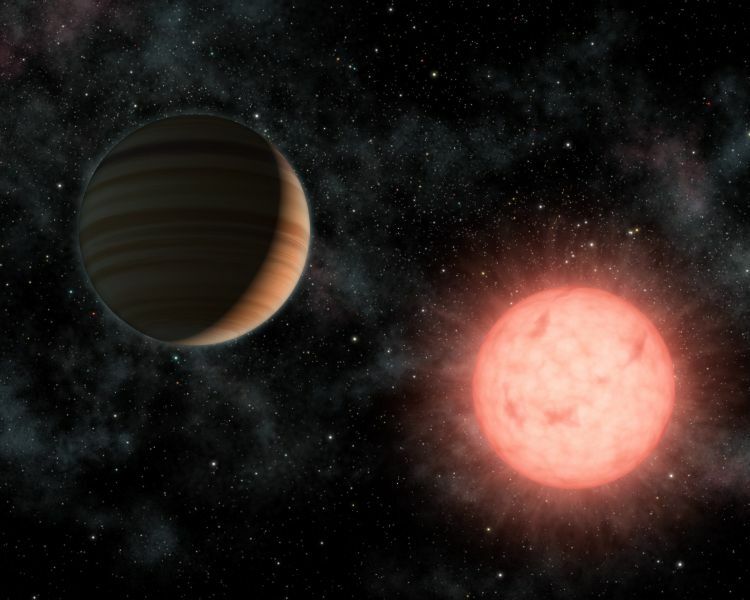 The astronomers used an instrument mounted on a five-meter (16.4-foot) telescope at the Palomar Observatory after nine years of intermittent but carefully measured observations -- in a larger 12-year study of 30 stars called the Stellar Planet Survey (STEPS). Orbiting a star with only around some 70 to 80 Jupiter-masses (Pravdo and Shaklan, 2009), the planet is the first found outside the Solar System using astrometry after a half century of attempts. Many dim, red (M) dwarf stars exhibit unusually violent flare activity for their size and brightness. These flare stars are actually common because red dwarfs make up more than half of all stars in our galaxy. Although flares do occur on our Sun every so often, the amount of energy released in a solar flare is small compared to the total amount of energy that Sol produces. However, a flare the size of a solar flare occurring on a red dwarf star (like Wolf 1055 A or B) that is more than 40 thousand times dimmer than our Sun would emit about as much or more light as the red dwarf does normally. Flare stars erupt sporadically, with successive flares spaced anywhere from an hour to a few days apart. A flare only takes a few minutes to reach peak brightness, and more than one flare can occur at a time. Moreover, in addition to bursts of light and radio waves, flares on dim red dwarfs may emit up to 10,000 times as many X-rays as a comparably-sized solar flare on our own Sun, and so flares would be lethal to Earth-type life on planets near the flare star. Hence, Earth-type life around flare stars may be unlikely because their planets must be located very close to dim red dwarfs to be warmed sufficiently by star light to have liquid water (less than 0.08 AU for Wolf 1055 A or B), which makes flares even more dangerous around such stars. In any case, the light emitted by red dwarfs may be too red in color for Earth-type plant life to perform photosynthesis efficiently. The following star systems are located within 10 ly of Wolf 1055 AB. Up-to-date technical summaries on this star can be found at: the Astronomiches Rechen-Institut at Heidelberg's ARICNS for Star A and Star B, the NASA Star and Exoplanet Database for Stars A and B, the Research Consortium on Nearby Stars (RECONS) list of the 100 Nearest Star Systems; and the SIMBAD Astronomical Database for Stars A and B. Additional information may be available at Roger Wilcox's Internet Stellar Database.